This last Sunday before Lent begins the Gospel presents us with a familiar message. 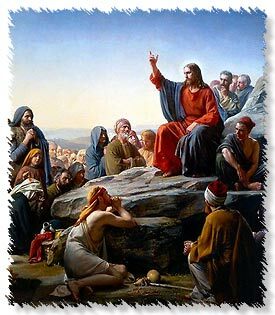 In the Beatitudes Christ shared on the Sermon on the Mount we hear the oft heard and less often fully lived “Blessed are they’s” of Christ. To share in the blessings of the poor in spirit, meek, and persecuted does not fit well with the self-centered prosperity gospel that many long to hear. Even those who may hunger for what Christ is calling us to may, because of the familiarity, enter into a “yes I have heard this before” slumber. But before we wrestle with poverty of spirit or meekness or any of the other precepts of our King we might consider the basic affirmation and promise He makes. What is it to be “blessed”? This frequently repeated word in both Old and New Testament could accurately be expressed as…HAPPY. In the Greek of the New Testament the word can be expressing…”blessed…. happy… adorable”! It is a challenge to humanity but the simple Biblical truth is that the longing of the Sacred Heart of our Lord is to see His creation, women, men all the children of God in the happiness God longs to share and nurture in our lives. This paradox is difficult for those who thrive on a God of vengeance and wrathful purity. It is also difficult to reconcile with the poor of spirit, persecuted and struggling we see in the beatitudes. Jesus is sharing this “blessing” in response to a common trait of believers. There are those in the crowd who upon the subject of Mary, the Blessed Mother, proclaim with fervor her blessed state. It is sometimes so much easier to project and assume God’s blessings…true happiness for others. We in false humility, fear or simple doubt are reluctant to hear and heed what Jesus would say. The blessings, the happiness that God designs us to live and grow in are simply found in living His Word. But….this brings us to the very basic question of how are we to study, to understand the Bible? Believers over the ages have struggled with this issue. By the time of Christ the Pharisees and Sadducees had developed two distinct schools of Scripture interpretation. In our day and age with the plethora of Bible versions the matter is even more pronounced. While their many distinct aspects of Bible interpretation any serious student of Scripture will probably prefer and follow on of two major approaches. The fundamentalist and generally conservative approach will take and adhere to a literal reading and understanding. In the Beatitudes this works albeit with a real wake up call to the vitality and depth of our faith. This is healthy and needed in our faith. However this literal approach runs into a major obstacle in this same sermon for but a few verses later Jesus is saying if our hand offends us the cut it off or if our eye offends us pluck it out. In the context of dealing with temptation and the occasions of sin this would leave most of the people in the church either maimed or partially blind, if interpreted literally. Now if we follow the critical thinking approach of studying the actual Greek or Hebrew words along with determining the actual person who “wrote” the message evaluated in context of text, time, place, custom and the personality and background of the writer we gain a rich and often much debated interpretation. This approach is valid and essential in the ongoing quest of the Truth of the Gospel. However it frequently becomes an intellectually elite school of scholars that disdain any approach other than the course of interpretation of which they approve. Many out spoken critical thinking scholars develop a pseudo-magisterium of liberal theology that is vehement in their fundamentalist fervor of refusing to acknowledge validity to any school of thought other than their own. This is a sad trait shared with their fundamentalist siblings. All the while the strict adherence to one school of Bible study versus the other leaves many believers bewildered or excluding others and themselves from the very blessings and happiness that God longs for us all to…..share. What is the answer? Perhaps it is in a critically thinking approach that allows that portions of Scripture are clearly meant to be received as written, literally. It is in the yielding of our body, souls (minds) and spirits in a living faith that seeks and allows the Holy Spirit of God to lead and teach us in the living and growing Truth that is the Gospel of Jesus Christ. As we prayerfully study Christ’s message in the Sermon on the Mount, Luke 11:28 and especially John 14 -17 we hear our Lord calling us to a living relationship with He who is the Truth that sets us free to be blessed as God desires. We need to stop restricting Christ to the finite little boxes of our understanding, intellect or pride. The Gospel of the Kingdom is far to big for anyone of us to try to confine the mercy and love, the holy happiness and blessing that is Christ. It is then we experience that Christ and the Gospel are fully relevant for all ages.